Found one file extension association related to Tropico 4 and 1 file format developed specifically for use with Tropico 4. Tropico 4 expands on the gameplay of the previous game with new political additions – including more superpowers to negotiate with, along with the ability to elect ministers into power to help get your more controversial policies passed. But remember to keep your friends close and your enemies closer as everyone has an agenda! Your political mettle will be thoroughly tested, as new natural disasters will have the populace clamoring for you and your cabinet to help them recover from some of the worst Mother Nature can dish out. 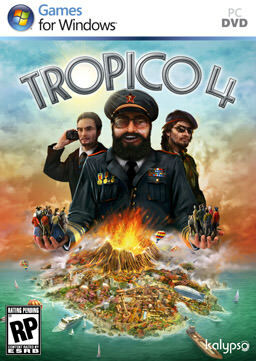 Tropico 4 also brings a new level of social interaction with the addition of Facebook and Twitter integration. Post comments on Twitter direct from the game and have updates go out when you complete missions or unlock new achievements. You can even take screenshots of your burgeoning island and post your dream creation on your Tropico 4 Facebook page and compare your interactive Dictator Ranking on the online leaderboards. If you need more information please contact the developers of Tropico 4 (Haemimont Games), or check out their product website.